You are Here. Don’t Mess it Up. Floating somewhere in the vast emptiness of space is our little planet. Seen from a distance of nearly a billion miles away, it is a tiny blue dot – hardly noticeable. It appears blue, in large part, because of the presence of vast oceans of rare (in the grand scheme of things) liquid water and because of the way light interacts with the thin film of atmosphere coating the Earth’s surface like the skin of a peach. Without these two vital natural resources, there would be no life as we know it. Until the last few decades, we have not had the opportunity to see our world as a single, unified whole. 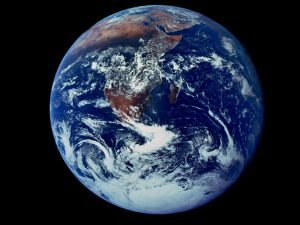 The first image of the full Earth was taken from space on December 7, 1972 by the Apollo 17 astronauts and helped change the way we see ourselves. It also helped stimulate a nascent environmental movement by bringing home the stark fact that we are not just individuals, or ethnic groups, or nation-states, but a single, isolated planet. This week, another photograph brought home — even more starkly — both our cosmic insignificance, and the miracle of life in a largely cold, vast, and lifeless universe. 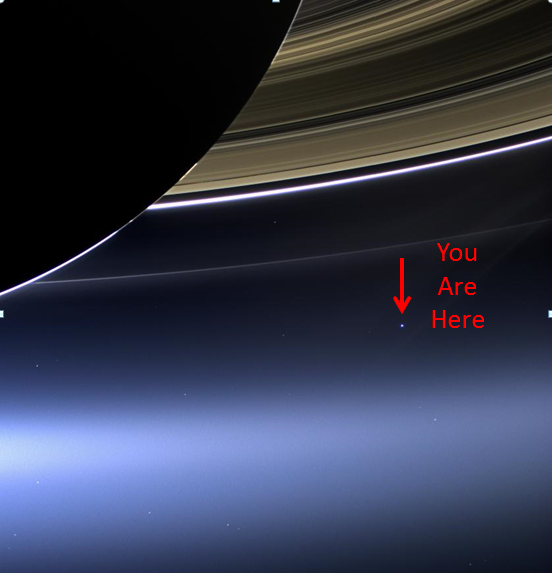 That picture, taken by the remarkable Cassini spacecraft circling Saturn, shows the Earth and Moon as tiny points of light. We are those points of light, and if we don’t take better care of our water and climate, the universe will be an even lonelier place. Look at the picture. We are here and only here. Let’s not mess it up. Thanks, Maven. Though my point was not really to highlight our cosmic insignificance — in fact, since we’re the only planet with life that we know of, we’re stunningly significant. The more important point was: we’d better do a better job of taking care of this little point of light in the sky.